Bubble Builder Studio | Infinite air filled creativity with bubbles! Make yourself a bubble tornado! 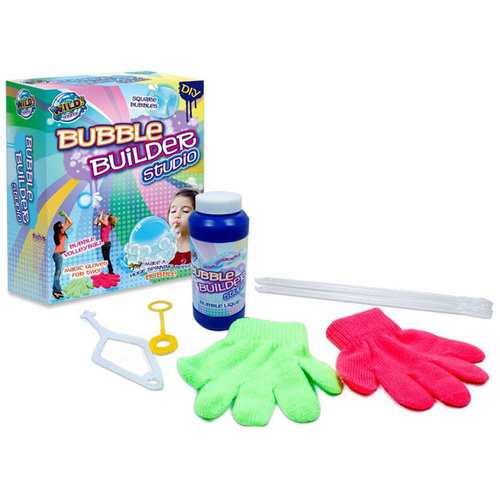 In this box, you will find the best long-life bubble solution on the market, along with games and experiments for you and a friend as you explore the fascinating scientific principles behind bubbles! You'll find all the tips and tricks you need to achieve your goals! You can learn to blow bubbles inside of bubbles, achieve a wubbly bubble worm with multiple bubbles, play a game of volleybubble and make yourself an impossibubble! Not to mention creating a bubble tornado and bubble breeding bubble! Contents: Long-life bubble solution (236ml), 2 x magic gloves, 2 x bubble blowing wands, 2 x bubble piercing tubes and a colour instruction booklet. Recommended for ages 6 and up for use under adult supervision. Please read the instructions prior to use, follow them and keep them for reference. The bubble liquid is non-toxic but do not drink or apply to mouth and eyes.